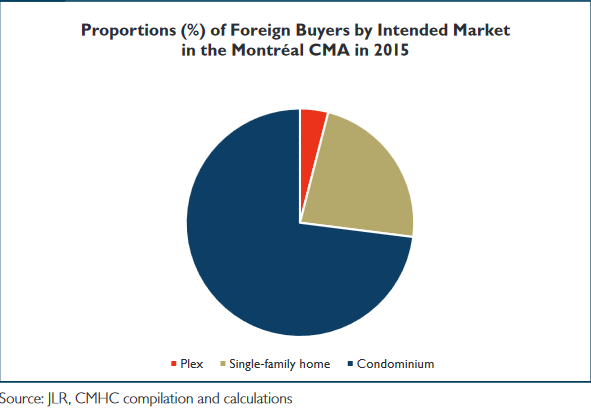 Foreigners own 1.3% of homes in Montreal and 4.9% in downtown Montréal, according to the CMHC’s latest Housing Market Insight Report which focused exclusively on foreign investment rates in the Quebec city. The Crown Corporation surveyed condo managers in the greater Montréal area, asking them to provide the number of units in their buildings owned by foreigners. And while additional foreign ownership statistics will certainly be welcomed by industry players, even the CMHC acknowledges potential issues with this specific data. The CMHC noted foreign owners could use a local address for correspondence. This latest report follows previously released data on foreign ownership in Toronto and Vancouver. To view the latest report in its entirety, click here.